At Byker Hall Care Home we offer the same exceptional levels of care and the highest possible quality of life as we do across all our other homes. Review submitted by Laura R on 23 November 2018.
Review submitted by Susan C on 20 November 2018.
Review submitted on 16 November 2018 by J J (Daughter of Resident). Review submitted on 15 November 2018 by Margaret D (Daughter of Resident). Review submitted on 30 October 2018 M D (Daughter of Resident). Review submitted on 4 December 2017 by V F (Daughter of Resident). “I am 100% happy for my mum to go on living at Byker Hall. She and all the family are definitely content in knowing our mum is safe and happy. Review submitted on 12 June 2017 by M B (Son of Resident). I am writing this letter as a big thank you to Maureen, Bernie and Danielle for taking my Dad, my Mam and myself out together with two other residents from Byker Hall to Chester le Street Park. My Mam and Dad have not been out together for over a year and the three Carers worked very hard to make sure we ALL had a very special day out. I think these trips out are a real lifeline for your residents at Byker Hall and I cannot speak highly enough of the dedication your staff make to our lives. The commitment and care shown by Maureen, Bernie and Danielle is a credit to Byker Hall. So happy that my mother has found a lovely care home. The staff are very caring and helpful. The activities are coordinated very well. Overall the care home is very well run. My mother went into Byker Hall in April 2016 following a stroke, also suffering from dementia. We didn’t expect her to survive more than a few weeks but with the care and attention staff gave mam, we were very fortunate to have a further year with her. They really brought mam on, getting her motivated with activities and outings. I would recommend this care home to anyone looking for nursing care. My dear husband has only been in Byker Hall for a week, but in that short time, I have to say that the care he has had so far has been exemplary. The manager and staff are all absolutely wonderful and the compassion they have shown to me is very much appreciated. This is such a comfortable and clean home and deserves nothing but praise. Thank you all so very much. My darling mother- in-law has been living in Byker Hall for one year now. Before she went to live there she was very confused and distressed. 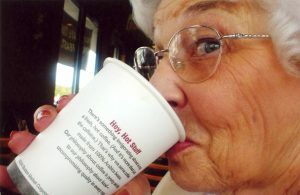 She often told us (her family) she was lonely and unhappy. After months of searching, we found Byker Hall. And now I’m so happy to say what a lovely place it is. It’s spotlessly clean, brilliant activities every day, the food great and if that’s not enough the staff are amazing. One year on our mum is safe, settled, clean, and well fed, she hasn’t been ill in all that time, but best of all she is not lonely! I know how harrowing it is to make the massive decision for your parent or loved one to live in care, but I have to say how grateful I am to the manager and staff for giving me the comfort of knowing mum is so well cared for and is happy. They treat her with dignity and respect, they are caring and friendly. I would definitely recommend Byker Hall. I am an assessor with Newcastle College and currently have students in placement at Byker Hall. I would like to compliment the staff there for the support and guidance they give to the students. It leads to a good experience for them and sends them into care work with a good understanding of the job role. In particular, Bernie and Maureen the activities co-ordinators, who has really welcomed the students and encouraged them to take part in activities in the home. On Wednesday I observed an armchair exercise session with the residents. This was outstanding. Bernie planned and prepared the environment with the help of my student and then actively encouraged the residents to take part. The session itself was fun and exciting and Bernie demonstrated the moves enthusiastically and every person in that room tried their best to follow her direction. In the break, she gave drinks to hydrate and she talked about the benefits of gentle exercise. Even family members were welcomed and joined in. Great to see this great practice. 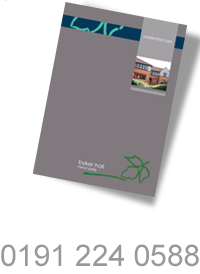 Byker Hall is an excellent care home for both respite and nursing care. Our mother has been previously at the care home for 2 respite visits. We were so impressed by the excellent care, friendliness and dedication from staff that we did not hesitate to place her there again but on this occasion for nursing care. I would highly recommend that if you are looking for a care home for your relative you give them a visit. Everybody is so friendly, you are greeted at the entrance by reception and manager. So helpful and easy to talk to about any issues you may have. A very friendly and caring home. I would recommend Byker Hall Care Home to any of my friends if they were in the same situation as me and my family were to make a decision for my aunt. My wife is happy enough here, myself and my family regard the home as very good. The staff are very helpful and pleasant. We the family, are very satisfied with Byker Hall.